The answer to one of the most exciting questions in particle physics seems almost close enough to touch: Scientists at the Geneva research center CERN have observed first signs of the Higgs boson and now believe that they will soon be able to prove the existence of the elementary particle they have been trying so hard to isolate. It is the last missing piece in the puzzle of the Standard Model of particle physics to explain the structure of matter. A discovery would be sensational news. "We indeed may have observed the first evidence of the Higgs particle, but it is still too early for a definitive statement," says Professor Dr. Volker Büscher from the Institute of Physics at Johannes Gutenberg University Mainz (JGU) in Germany. "And if this evidence turns out to be correct, the data now being analyzed will for the first time provide information about the mass of the Higgs boson," adds Professor Dr. Stefan Tapprogge. At Mainz University, some 50 physicists participate in CERN's research, in particular in the ATLAS experiment, one of two major experiments tasked with searching for the Higgs particle. The particle was predicted almost 50 years ago and is named after the British physicist Peter Higgs. Since then, scientists all over the world have been searching for it. Its discovery would explain the origin of the masses of all other elementary particles. Just two years after its start, proton-proton collisions at the Large Hadron Collider (LHC) have now delivered the results which raise scientists' expectations. "At this point in time, we can make two statements," Büscher says. "First, if the Higgs boson actually has the characteristics it is assumed to have, then its mass must be between 115 and 131 gigaelectron volts – a much smaller window than just a year ago. Second, we have found a very intriguing excess of events, which could be the first direct evidence of a Higgs boson with a mass around 125 GeV." The experiments at CERN will continue next year. If the evidence is confirmed, the Higgs boson would be about 125 times as heavy as a proton. In addition to this new data from the ATLAS detector, the second large particle detector at LHC, the Compact Muon Solenoid (CMS), has revealed similar indications. Confirmation would be a dream come true for the scientists working with Volker Büscher and Stefan Tapprogge. Many have dedicated their academic careers to the hunt for the Higgs particle – and are involved right now when things get really exciting. "This is a great moment for us all, and it would be wonderful if the observations were confirmed," says Tapprogge. Scientists are not yet speaking of a discovery, because it is still too early: The number of events observed is not yet large enough to statistically rule out a random effect. However, the fact that two independent experiments, ATLAS and CMS, both point in the same direction, creates excitement and raises hopes that this could indeed be the mysterious Higgs particle. The Higgs boson was predicted in 1964. Within the theory, it would give mass to the other elementary particles of the Standard Model. According to the physicists, the entire universe is filled with the so-called Higgs field. Depending on how strong the individual elementary particles couple to the Higgs boson, they would have more or less mass. If the missing particle is actually discovered, this would not only confirm a model but would also mark the beginning of a new field of research. The LHC provides ideal conditions to study the Higgs field and the origin of mass in detail, especially with the even higher proton beam energy scheduled for 2014 onwards. 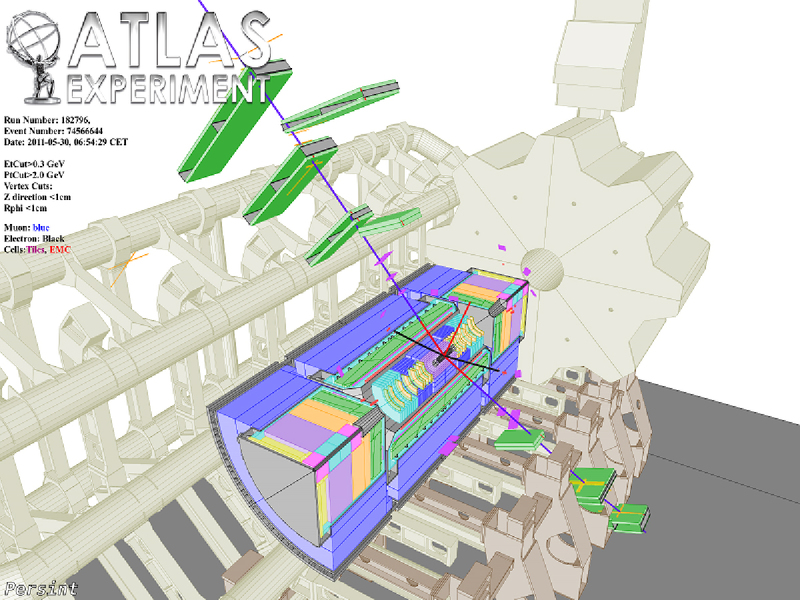 The researchers of the working group for Experimental Particle and Astroparticle Physics (ETAP) at Johannes Gutenberg University Mainz are involved in particular in the ATLAS experiment, one of two major experiments at the LHC. The ATLAS detector is 46 meters long, 25 meters high, and 25 meters wide. It is able to detect and precisely measure new particles produced during proton collisions. A total of approximately 3,000 researchers from all over the world are taking part in the ATLAS experiment. The work of the ETAP group is integrated into the Cluster of Excellence Precision Physics, Fundamental Interactions and Structure of Matter (PRISMA), which has successfully made it into the final selection round of the German Federal Excellence Initiative. llustration of a proton-proton collision which might have produced a Higgs particle, recorded at the ATLAS detector. Shortly after its emergence, the Higgs boson converts into four particles, which can be found in the detector.